Turbulence is a real limiting factor in High Resolution Astronomy. A 250 mm telescope is intrinsically able to provide a resolution of 0.5 arsec: this resolution cannot be reached because of the atmosphere turbulence, that behaves like time-varying random phase screen, destroying the image, like a bad shaped mirror. light, as a "peak to valley" or rms distortion. The way to reduce the turbulence effect is to reduce the exposure time, if the brightness of the object allows, so that it freezes the atmospheric turbulence. The webcam users have used this method for years now, allowing them to get outstanding images, called the "lucky exposure" method. The webcam allows nice frame rate (up to 30 frames per seconds), with resolution up to 640x480 pixels, for a very cheap price. Ro can be defined as the diameter of a wavefront area over which the rms phase variations due to atmosphere turbulence are equal to 1 rad (Lambda/6.28). The ro parameter is a very good way to assess seeing and has been widely used since. This r0 parameter defines the observed seeing : 251 * Lambda / ro (ro in mm, lambda in µm) For instance, a ro=100mm gives at Lambda=0.55µm a seeing of 1.38 arcsec, a ro=305mm gives a seeing of 0.45 arsec. Good astronomical sites, like Paranal Obs. can get ro up to 400mm (s=0.35 arcsec), whereas ro from 40 to 80mm (s=3.5-1.5 arcsec) are typical values for most places. This formula is valid whenever D > 3.5 ro, in that case P is equal to one. For instance a 305mm telescope, used under turbulence of ro=47mm (3 arcsec seeing) will provide a "good image" every 128 frames. To get all frames having wavefront distorsion not above Lambda/6.28 (i.e. 6.28 = 2*Pi), a ro=93mm is needed (i.e. 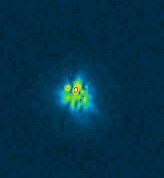 a 1.48 arcsec seeing) using the same 305mm telescope. Nevertheless, the Lambda/6.28 is a tough criteria, and likely, good images can be achieved with wavefront distorsion from Lambda/4 to Lambda/3 rms. The next table provides the r0 max allowable for each Diameter, where in that case all images match the Fried criteria. As a sample, a part of a 300 frames sequence is shown here (figure 1), each exposure is 67ms (Vesta Pro Webcam). The pixel scale is 0.12 arcsec per pixel, recorded at the cassegrain focus of a qualified lambda/10 PTV, 305mm Schmidt cassegrain (focal length 9200 mm). The seeing has been judged as very mediocre by the owner of the telescope (the famous T.Legault). It easy to measure the seeing using this 20s sequence. This is the image (below figure 2, same scale as top images) that should be recorded without turbulence. The FWHM is 0.45 arcsec. The turbulence induces a fast shifting (figure 3) of the star : due to slopes distortion applied to the wavefront by the atmosphere. 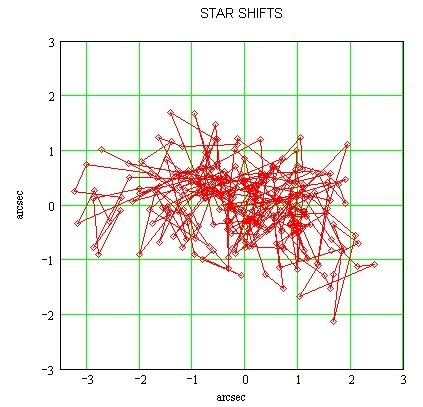 - Turbulence induce star shifts, quick, the mean displacement is 0.64 arcsec between two 66ms exposures. Figure 3 : 20s sequence (300 frames, 66ms), the diamond symbol shows the star centroid for a given frame. If the image are stacked without reshift (image registration), the image exhibits a 2.8 arcsec FWHM (vertical direction, figure 4), if the image are reshifted and added (figure 5) the star FWHM is 2.3 arcsec, which is an improvement of 20% in term of resolution. This is anyway 5 time the resolution that can be achieved with a 305mm telescope. With 2.8 arcsec, ro has been computed to 40 mm. Knowing ro, the seeing can be estimated to 3.5 arcsec. With r0=40mm, 1 frame per 1958 will match the lambda/6.28 criteria. As a conclusion, the telescope diameter (main pupil size) has to be tailored with median seeing of your observing site. This section deals with software simulation. 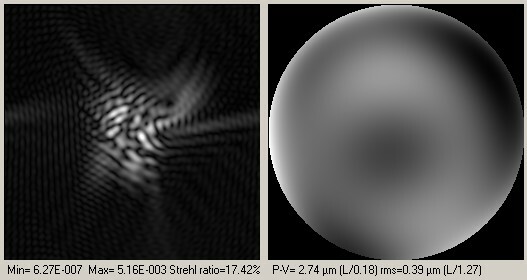 The turbulence effect can be simulated by degrading the entrance wavefront, and computing the star shape or PSF built by the telescope+wavefront. Zernikes polynoms have been used for this simulation. As shown hereafter, wavefront is the right circular shape (figure 6), the variation of image intensity within this disk shows (in Z) the wavefront phase shifts. This demonstrates quickly that Lambda/30 PTV mirrors are not really usefull (!) Lambda/5-10 ptv mirrors are good enough, and more likely, the telescope will never see calm an quiet turbulence conditions to be able to notice a difference between a L/4 and L/30 mirror. Software (written by myself).... that made the simulated PSFs and wavefronts. FWHM : full width at half maximum : this is the diameter of the star when half of its maximum intensity is reached. 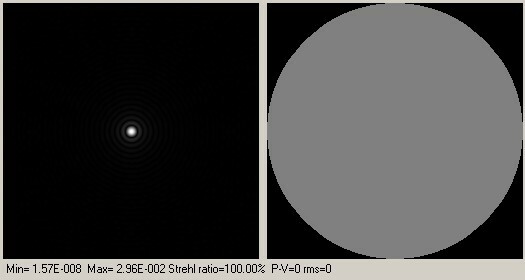 Strehl Ratio : A ratio of the amount of light focused into disk center of the Airy disk by a perfect optic (wavefront error = 0.0) versus an optic with aberrations (wavefront error > 0.0). 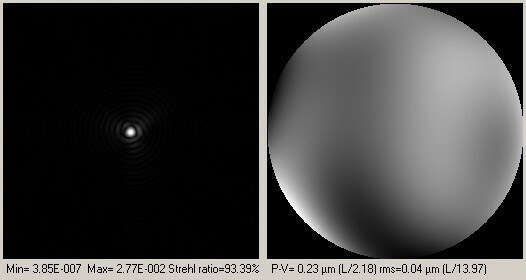 By definition, a diffraction limited telescope (including central obstruction) focuses 68% of the incoming light into disk highest central pixel. 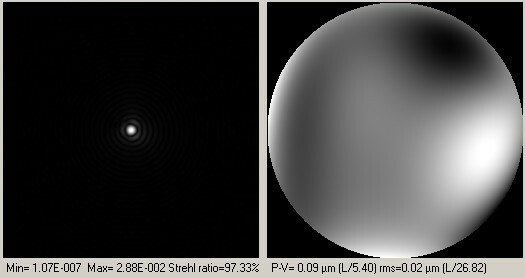 The maximum amount of light that can be focused by a perfect unobstructed optic is 84% which is equal to a Strehl ratio of 1.00. Dividing 68% by 84% yields a Strehl ratio of 0.80. 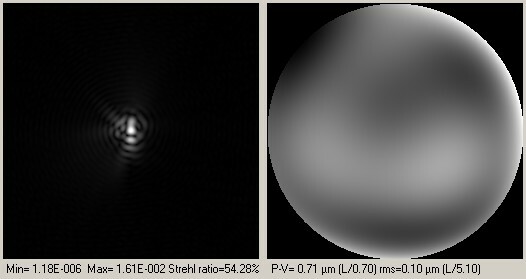 An optical system with a Strehl ratio of 0.87 focuses 73% of the light energy. The higher the Strehl ratio the better the optic. 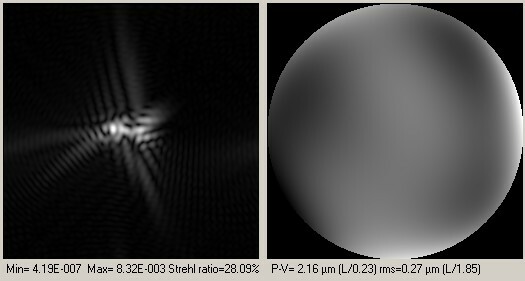 The Strehl ratio of a Newtonian telescope optical system can only be determined via computer analysis of interferometric fringes or shack hartman sensors.